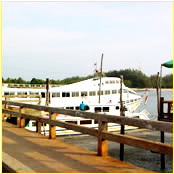 FERRY: Ferries run twice daily from November through April (dates can vary with weather). 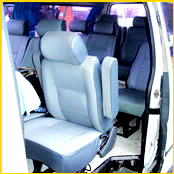 MINIVAN: Public aircon minivans operate year-round several times per day. 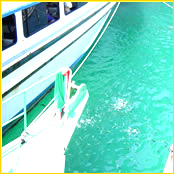 The number of trips per day varies with the seasons, with the first leaving at around 11am and the last at around 3pm. 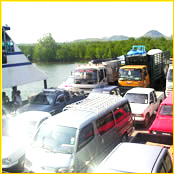 The trip takes around 2.5 hours and includes two car ferry crossings. Cost is 200 Baht per person. Note that these vans can be overloaded, crowded & feature loud music. Leaves from Thana Tours opposite City Hotel, Krabi. Cost is 200 baht per person, children under 12 half price. 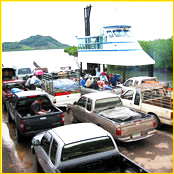 The trip takes around 2.5 hours and includes two car ferry crossings. Cost is 200 Baht per person. Note that these vans can be overloaded, crowded & feature loud music. Leaves from KK Tours opposite Trang Train Station. 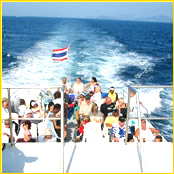 FERRY: Ferries now run daily all year from Phuket to Koh Lanta via PhiPhi. 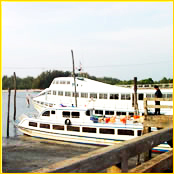 The ferry will take 2 hours from Phuket to Koh Phi Phi and another 1 hour from Koh Phi Phi to Koh Lanta. 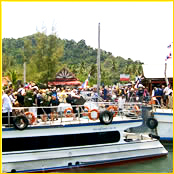 Note that the connecting and changing ferry will take one and half hour which you can do some shopping on Koh Phi Phi and only the 8:00 am ferry from Phuket can get through on Koh Lanta in the same day, the afternoon ferry need to stay overnight on Koh Phi Phi. Cost is 500 Baht per person, children under 12 half price. Operates daily all year.